I was reading some of Angela Nagle‘s essays online, and reviews of her book Kill All Normies. She’s a fascinating and incisive writer, and in this book she takes a hard look at online cultures, social movements emerging online, the herd mentality in online interactions. She points out that the liberal left has drifted to become prudish, easily offended, anti-free speech and even anti-intellectual. The locus of irreverent, subversive, and playful thinking is now the alt-right, or apolitical online spaces of dubious reputation. The book has generated a storm of debate. 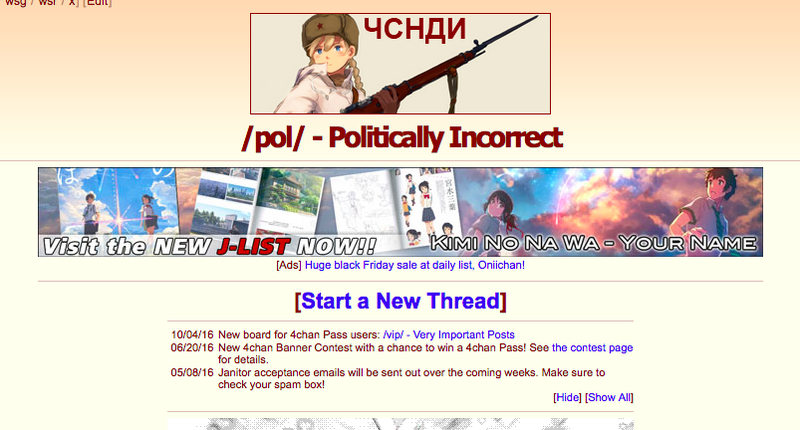 So I hopped it over to 4chan, and specifically the /pol/ section, which declares it is intended for politically incorrect discussions. This thread appeared in amongst the vilest cesspit-level racist and misogynistic threads before it and after it. It’s impossible to know to what extent an individual poster believes in the material he/she posts. It’s equally impossible to know if the responders to the philosophical thread are the same people posting in the other threads. But judging by the names so casually dropped, there are a lot of well-read and independent thinkers lurking on these boards. Meanwhile the typical Sunday newspaper essays are declining in quality to become clickbait opinion pieces.